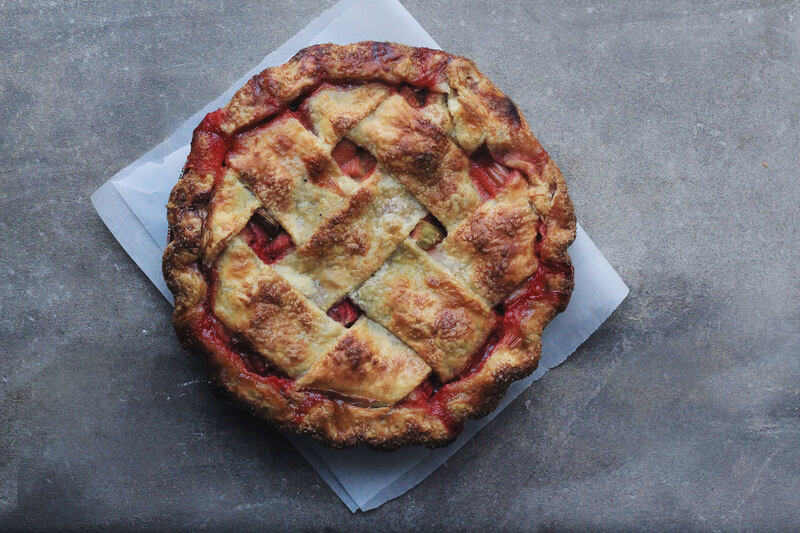 In honor of Pi Day tomorrow, here’s a recipe for one of my favorite pies: strawberry rhubarb. Strawberries have long been my favorite fruit; their sweetness, color and magical ability to turn any dessert into something delicious get me every time. But I only recently discovered rhubarb. Long stalks of mouth-puckeringly tart fruit streaked green and pink, rhubarb is the epitome of spring- especially when left to mingle with strawberries. The two fruits are combined, mixed with sugar and left to absorb the sweetness. Then, when they’re softened and juicy, they’re surrounded by a flaky pie dough and topped with a traditional lattice. What comes out of the oven is a bubbling, fruity pie that will fill your house with an intoxicating scent, and that when topped with a scoop of vanilla ice cream, says only one thing: spring! Why I love this recipe: enveloped in my flaky, flavorful pie crust, rhubarb and strawberries combine with nothing other than sugar and vanilla, allowing their true flavors to shine through. The rhubarb mellows and softens into silkiness, retaining a bit of its bite, and the strawberries turn cotton-candy sweet, a perfect match. Notes: be sure to let the pie cool for a good amount of hours (3-4, at least) in order to cut neat slices. As you can tell from the last picture, we were slightly impatient and cut in while it was still warm, which resulted in messy (yet, undeniably delicious!) slices. If the dough seems dry, add more water a couple of teaspoons at a time. Press the dough together, split it in half, form into discs and wrap in plastic wrap. Chill the dough overnight, or freeze for at least one hour. Combine the rhubarb, strawberries, sugar, cornstarch and vanilla extract. Let sit while you roll out the dough. Remove your dough. Then, working gently, roll out one disk of dough into a 12″ circle on a floured surface. Trim the edges. Transfer dough to pie plate. Fill it with fruit. Roll out the second disk and cut into strips. Lattice it on top of the pie. Crimp edges, or simply fold under. Brush with egg and water and sprinkle liberally with raw sugar. Bake for 15 minutes. Lower heat to 375 and bake for another 45-50 minutes, until the top is browned and the juices have thickened and are bubbling. Let cool for two hours. Serve warm or cold with vanilla ice cream. 13 Mar	This entry was published on March 13, 2014 at 11:48 am. It’s filed under Delectables and tagged baking, delicious, dessert, entertaining, favorites, food, lattice, march, photography, pi day, pie, recipes, rhubarb, spring, strawberries, summer. Bookmark the permalink. Follow any comments here with the RSS feed for this post. I know! Usually I’ll just do a crimped top crust, because who can wait to eat pie?! Really nice combination, yet I’ve never tried it. So far, rhubarb hasn’t made its appearance here. Can’t wait until it does! rhubarb’s tart- almost citrusy, in fact. goes amazingly well with strawberries! you’ll love it! Thanks! This was actually my first time doing one and I followed a super-simple guide, which I linked to in the instructions. Try it!